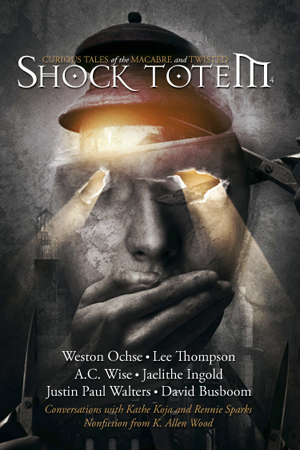 Posts Shock Totem Has Reopened Its Doors! Shock Totem Has Reopened Its Doors! To submit or check the status of a previous submission, click here. Fiction: We consider original, unpublished stories within the confines of dark fantasy and horror—mystery, suspense, supernatural, morbid humor, fantasy, etc. Stories must have a clear horror element. We’re looking for short stories up to 5,000 words (firm). Nonfiction: We want journalism, well-researched and emotionally compelling nonfiction about real horrors—disease, poverty, addiction, etc. We will also consider work on other, relative subjects within the confines of dark fantasy and horror. Flash Fiction: We interested in tightly woven flash fiction, 1,000 words or less. Microfiction: To avoid blank pages in future issues, we’re now looking for very short flash pieces, 200 words or less. Poetry: We’re interested in dark poetry on a limited basis. Submit no more than three poems at a time. Artwork: We typically solicit artwork. But if you think your work fits our style, please submit it. We’re not interested in hard science fiction, epic fantasy (swords and sorcery), splatterporn (blood and guts and little more), or clichéd plots. Clichéd themes are okay. We don’t mind stories about zombies or serial killers or vampires, but please make the overall piece unique. If the plot has been worked to death we will likely not consider it, no matter how well it is written. No fan fiction. Reprints. Unpublished work will always get first consideration. Any submitted reprint must not have been published within the last 12 months, and the author must retain all applicable rights. All previous publication information (for the submitted story only) must be disclosed. All submissions must be sent via our new Submissions Manager (see link below). Please use 12pt. Times New Roman, double-spaced lines. Use italics. Do not underline. Please name your submission file as such: STORY TITLE (WORD COUNT). Please include your full name, contact info, and word count in the document and cover letter (the cover letter is part of the Submissions Manager, not a separate file). We will not accept submissions from BilboSmeagol666. No simultaneous/multiple submissions (though you may upload up to three poetry submissions at one time). Do not send a second submission until we’ve accepted or rejected the first. Include published credits, if applicable. We’re open from February through May, and August through November. We pay 5 cents per word for original, unpublished fiction. We pay 2 cents per word for reprints. There is a $250 cap on all accepted stories. * Payment will be made within 60 days after publication. Authors accepted for publication will also receive one free copy of the issue their work appears in. We claim First North American Serial Rights and First Electronic World Rights (not to include Internet use) for a period of one year. After which all rights revert to the author. Many happy submissions to you all! !